Home > IBC | Tote | Tanks | Parts > Tote & IBC Blanket Heaters > Wrap-Around Plastic Tote Tank/IBC Heater 120v,1440w,36"
Home > Barrels & Drums > IBC | Tote | Tanks | Parts > Tote & IBC Blanket Heaters > Wrap-Around Plastic Tote Tank/IBC Heater 120v,1440w,36"
Home > Industrial Supplies > Heaters, Drum & IBC > Tote & IBC Blanket Heaters > Wrap-Around Plastic Tote Tank/IBC Heater 120v,1440w,36"
Home > Accessories > Heaters, Drum & IBC > Tote & IBC Blanket Heaters > Wrap-Around Plastic Tote Tank/IBC Heater 120v,1440w,36"
Tote tank/IBCs containing slow moving product such as honey, molasses, or lube oil can be difficult to dispense, especially when stored in a cool area or when winter strikes. Once the product is heated, dispensing becomes manageable. 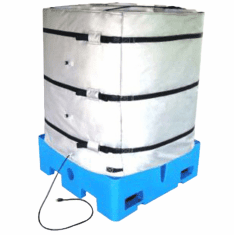 The Wrap-Around blanket design allows the tote tank/IBC to be heated in a non-invasive manner and will not contaminate or scorch product. 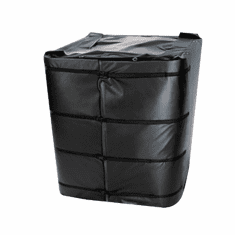 Constructed of silicone impregnated cloth facing and liner filled with 1/4" fiberglass insulation, the heater blanket is held in place with adjustable nylon straps with buckles (2 across the top and 3 around the tank). Includes a "mouse hole" designed for spigotaccessibility and a 6' power cord with standard plug: 120VAC - NEMA 5-15 or 240VAC - MEMA 6-15. An optional insulated top cover is available for faster heat-up and efficient temperature maintenance. 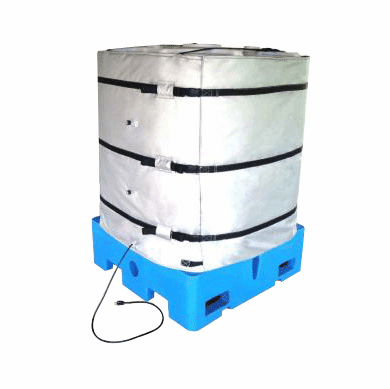 Questions & Answers about Wrap-Around Plastic Tote Tank/IBC Heater 120v,1440w,36"